Stoner rock band Stone Axe is releasing a split 7” with Mighty High, which sort of tells you that the album is going to be a smoked out 45rpm revolution. Curious, I checked out a video from Stone Axe’s self-titled LP, a song called “Riders of the Night.” Stone Axe kicks a solid groove. I won’t say that they’re much different from a lot of the so-called inhalant bands out there, but they’re tight and the song is really good. The 7” is out June 25th via Ripple Music and Stone Axe will be opening for Saint Vitus during a small tour out West. Just in time for their West Coast tour in support of the godfathers of Stoner Rock, St. Vitus, Stone Axe has announced that they will be releasing an exclusive split 7" with the Brooklyn-based stoner cretins Mighty High. This two-song disc features ground-breaking material from both acts. 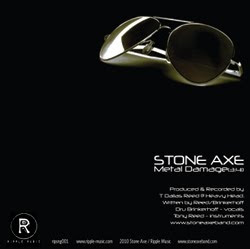 For Stone Axe, "Metal Damage" shows the band venturing into the lands inspired by the NWOBHM sound. For Mighty High, "Don't Panic, It's Organic" is the most focused, aggression-filled musical tantrum the group has unleashed to date. The 7" will be available on tour starting June 25th, 2010 and from the Ripple Music Store in early July. However, pre-orders are being taken now.